HMS Belfast is a retired 1930s Naval Cruiser which is open to the public, and is moored on The River Thames between London Bridge and Tower Bridge. 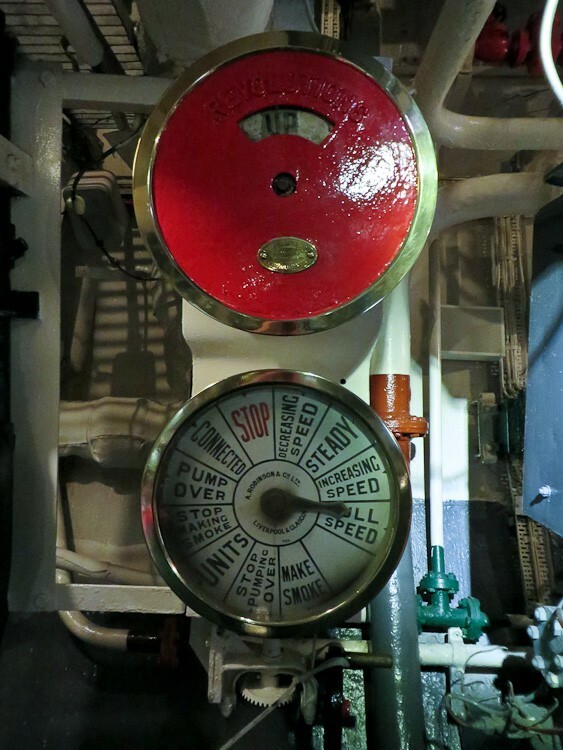 It is a fascinating insight into British Naval History since the 1930s, with interactive displays, and a chance to clamber down into the mighty engine rooms, and up to see the great views of the Thames from the upper decks. 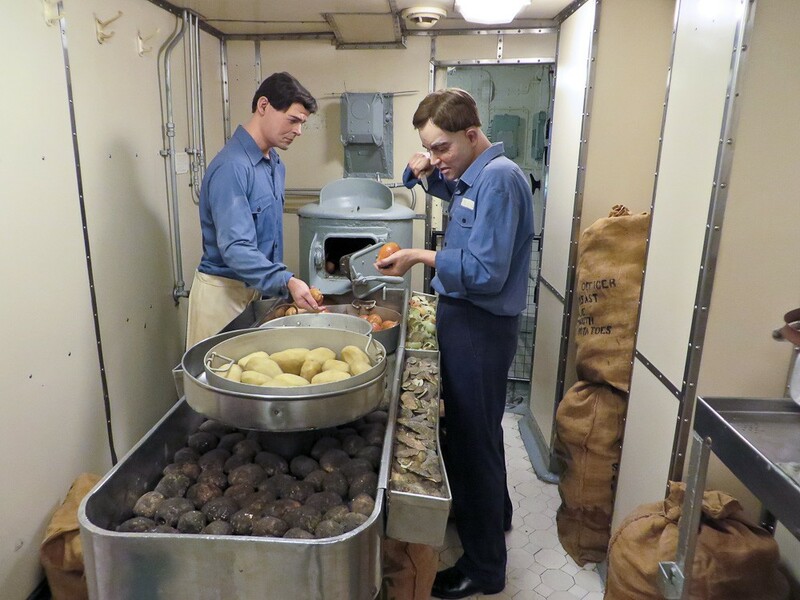 You'll see how hundreds of sailors lived together in cramped conditions, how the vast machinery running the ship worked, and what happened when the ship went into action! Ideal for those feeling fit and energetic as there are lots of ladders to climb! There is also a cafe and shop. Great day out for all the family. A visit to HMS Belfast is a fantastic way to learn about life on board ship in Britain's Navy from 1930s to the 1970s. The HMS Belfast tour for visitors can be split into three main parts: Life on Board (the domestic arrangements of the sailors), Life at War (what happened when the ship was called into action) and the Inner Workings of the Ship (behind the scenes). The Behind the Scenes section is down below the main deck, whilst the Action was mostly directed from the upper decks. 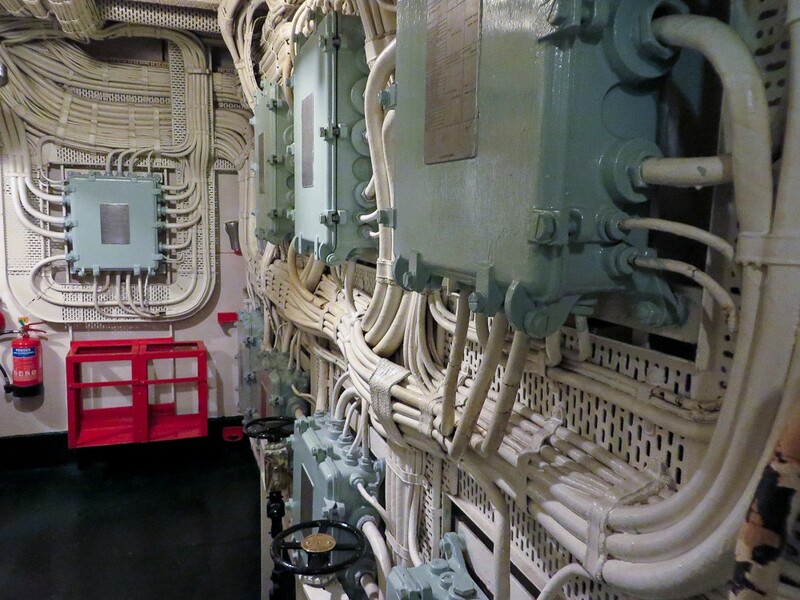 The Life on Board section centres around the main corridor which you use to explore the ship. 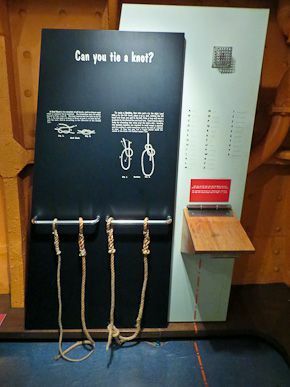 If you have children who enjoy "hands on" exhibits, there are some very interesting sections for them: The Gun Turret Experience, The Punishment Cell (you can go inside one, but you cannot close the door! 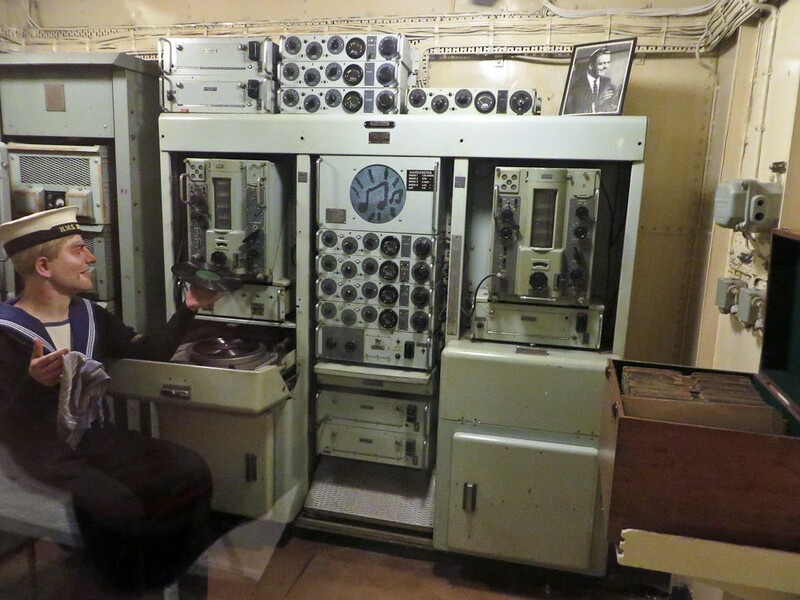 ), The Operations Room (you can plot your own wartime operation!) and the exhibition section where you can learn to tie knots and signal to other ships. 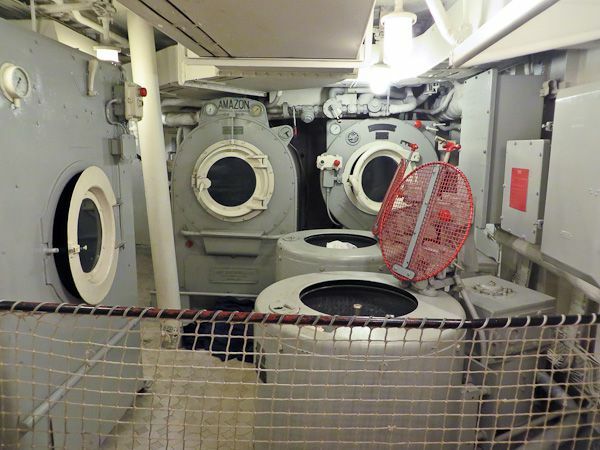 When touring the domestic arrangements of HMS Belfast, you get a real sense of what it must have been like to be crammed onto the ship with up to 950 other sailors. 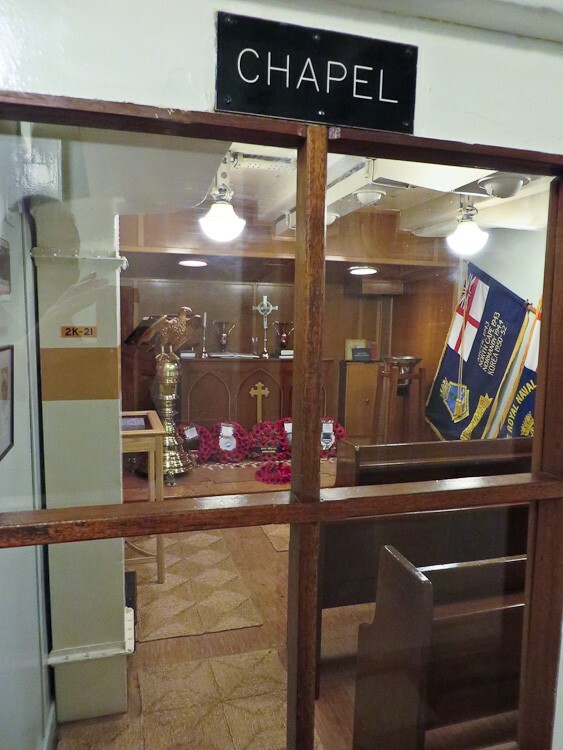 You see the chapel, dentist, sick bay (complete with operating theatre), galley, bakery, provision issue room, the NAAFI canteen, and the workshops used to maintain the ship. There's a sound reproduction room which provided "local radio" style entertainment. 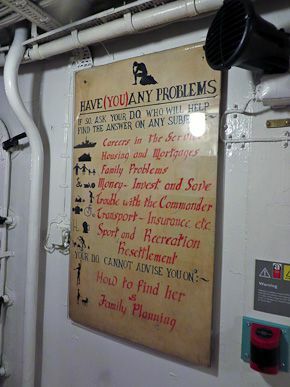 Dotted around the ship are original notices that give an insight into what was expected of the sailors while on board. You can even visit the punishment cells right in the bow of the ship. One of the most memorable features is the Arctic Messroom, where sailors lived and slept when they were not on duty, conditions are very cramped for so many men. 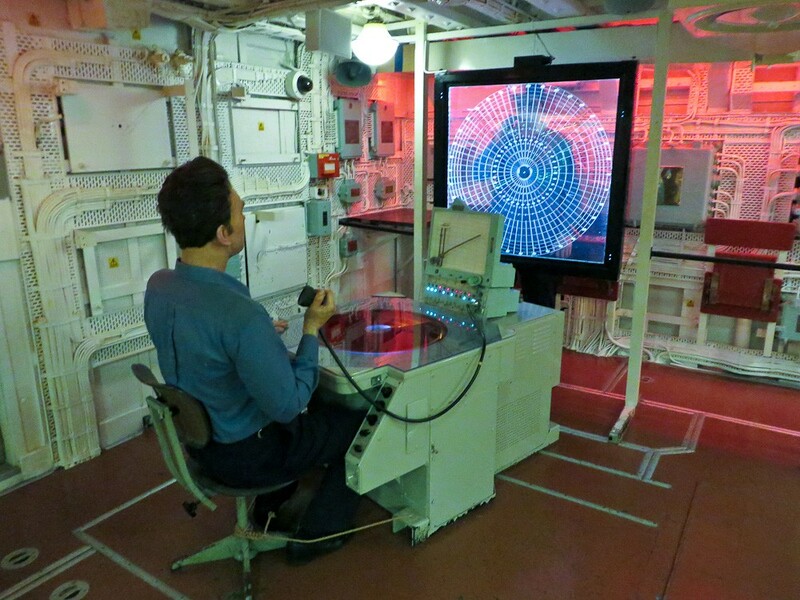 This aspect of the ship is shown mainly on the upper decks - the operations room and compass platform (this is where the captain controlled the ship while at sea), the Bridge Wireless Office, flag deck, the gun direction control tower and platforms, and the Admiral's Bridge (which the Admiral would use to control the whole fleet rather than just this single ship). 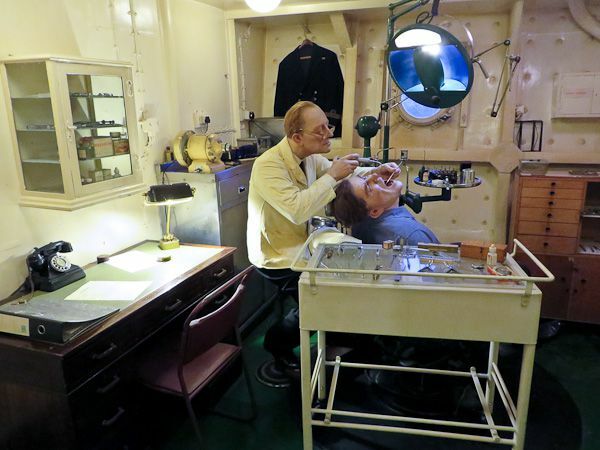 There are interactive displays in these areas too, allowing you to get a feel for what it was like to work on board HMS Belfast when she went into battle. 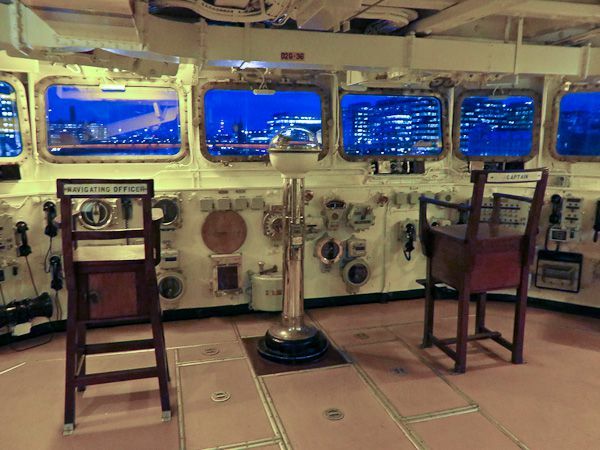 You can plot your own operation in the Operations Room, or you can sit in the Captain's chair, look through the front window, and imagine you are navigating down the Thames. 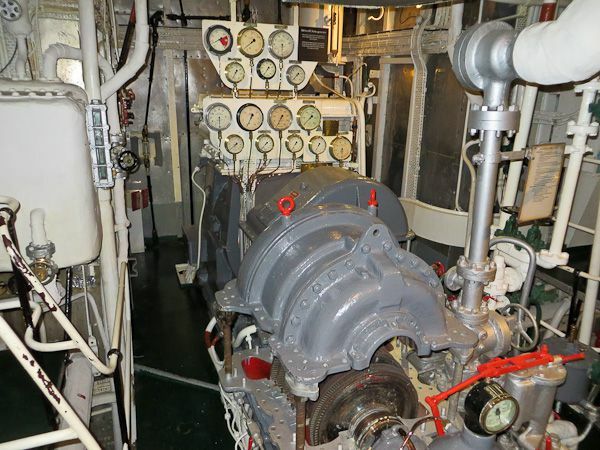 One of the most fascinating aspects of a visit to HMS Belfast is that you can explore the engine decks and see all the behind the scenes machinery that powered the ship. 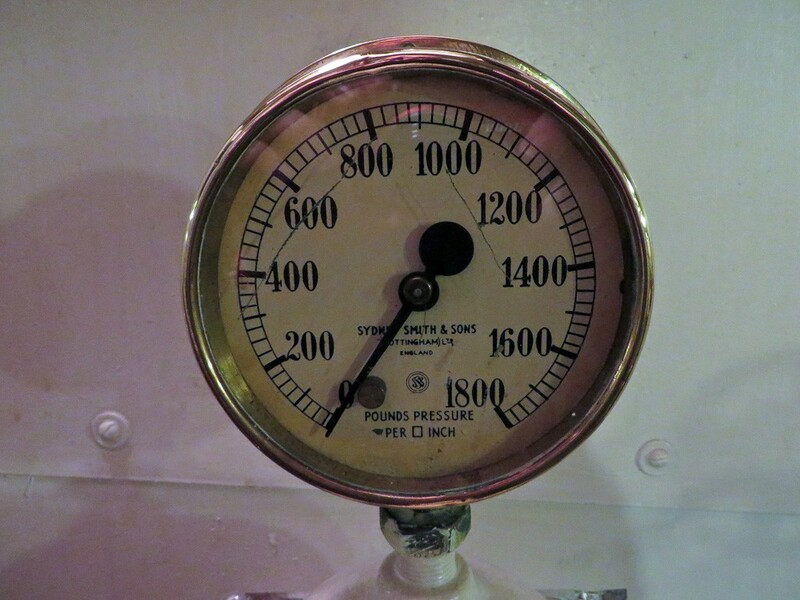 Down in the depths of the ship is the Engine Room, where you can see the amazing machinery that propelled the ship, and kept it running. The power of this vast machinery was huge - it put out the same power as 1,000 average family cars! The four turbine engines drove four giant propeller shafts, which could propel the ship through the water at 32 knots (59 km/h). 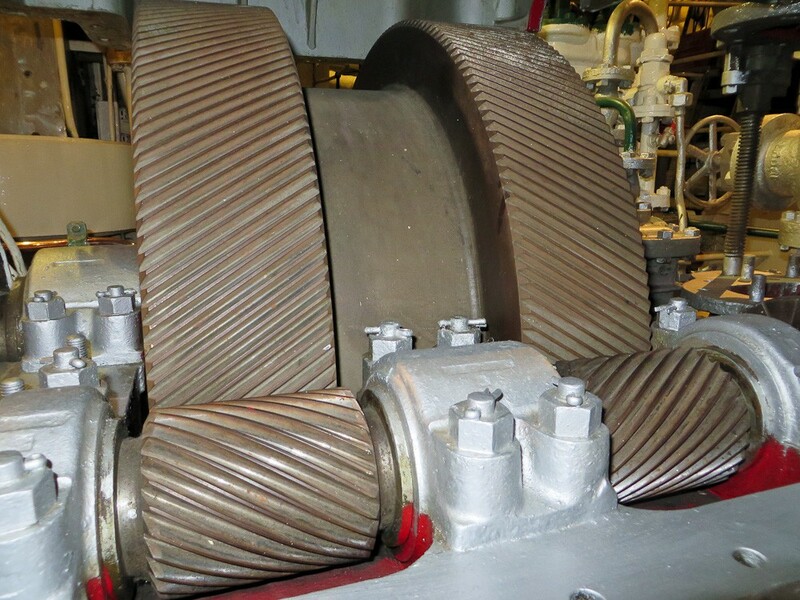 There was even a separate steam-powered turbo-generator which was used to distil seawater to be used both for the boilers and for domestic purposes. The ship's shell rooms where the ammunition for the ship's guns was kept were well below the water line - a well-protected area. We had a late lunch near the Tower of London, so we decided to walk over Tower Bridge for our afternoon visit to HMS Belfast. 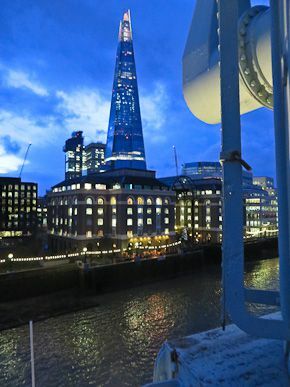 This is not the easiest or quickest way to get there - the nearest tube station is actually London Bridge - but the views up and down the Thames as we walked past the Tower and from Tower Bridge were great. We visited on an overcast January afternoon. There weren't many other visitors on board, as it was a weekday during school term-time - so we were free to wander around and take our time! The entrance to the ship is through the visitor entrance, cafe and shop building on the riverside. We walked along the long gang-way onto the ship, admiring the views of the Thames on the way. Once on board, we were offered complimentary audio tour head sets to guide us round the ship. We decided not to use them, as we were a bit limited for time, and just wanted to wander round the ship! 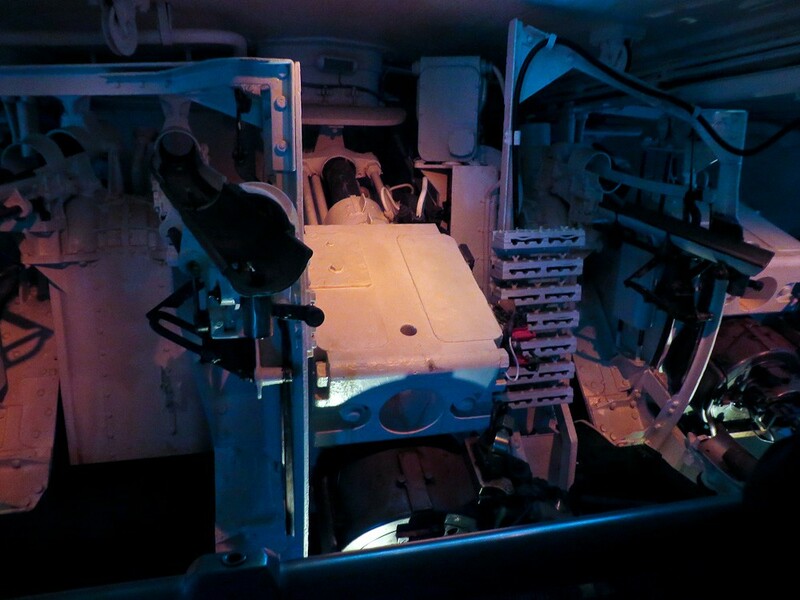 The first thing we saw was the Gun Turret Experience - this was very exciting. 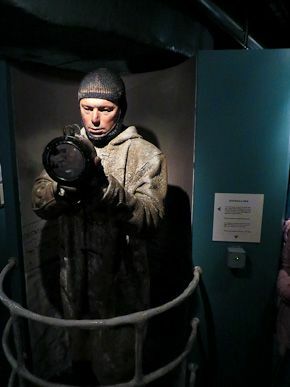 It is a gun turret which has been modified to show a video clip and re-create the sounds, vibrations and smells of being inside a gun turret in the middle of the action when the HMS Belfast was at war in WW2. You stand inside the turret behind the guns where the shells are loaded and watch the action unfold! Next we started our tour of the inside of the ship, along the Main Deck. This is where we found many of the exhibits about life on board. 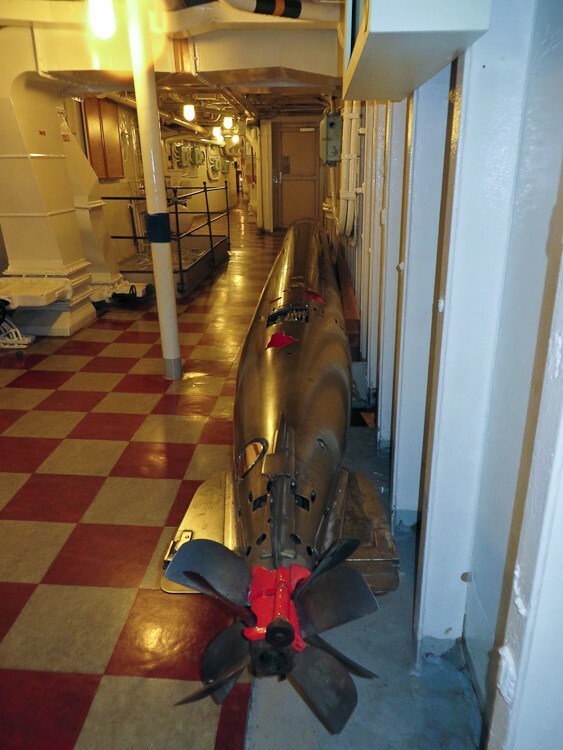 Look out for the large torpedo in the corridor which has been cut-away so that you can see some of the workings. The first exhibit we saw was the laundry, with huge washing machines and ironing presses. 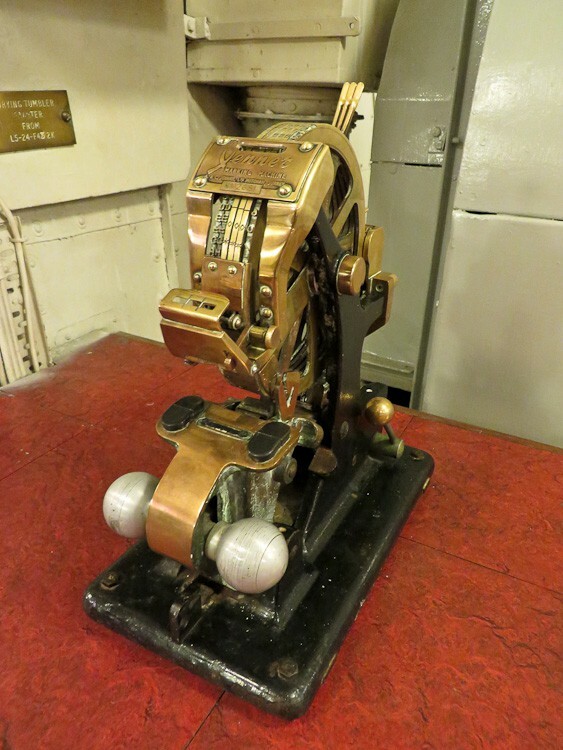 There was even a stamping machine which marked the laundry marks on the sailors' clothes. The laundry was created when the ship was re-fitted in the 1950s - before that each sailor had to do his own washing in a bucket! 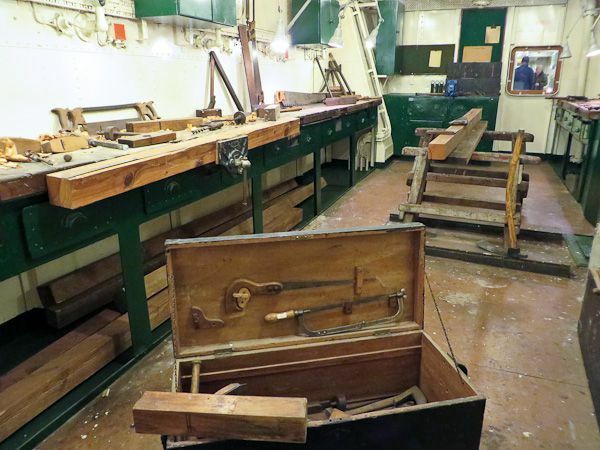 Next we found the shipwrights' workshop - a fully fitted workshop where the shipwrights maintained most of the fixtures and fittings of the ship. There were many and varied tools left in position as if the shipwrights had nipped off for a break and would be back any minute! 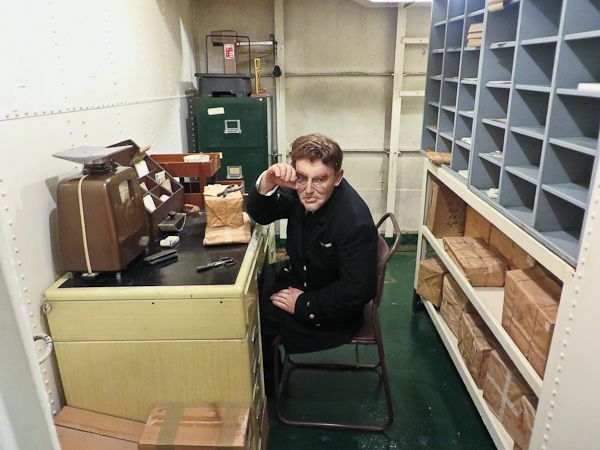 Then came the mail room, chapel and the sound reproduction room (which provided entertainment for the sailors on their long voyages). 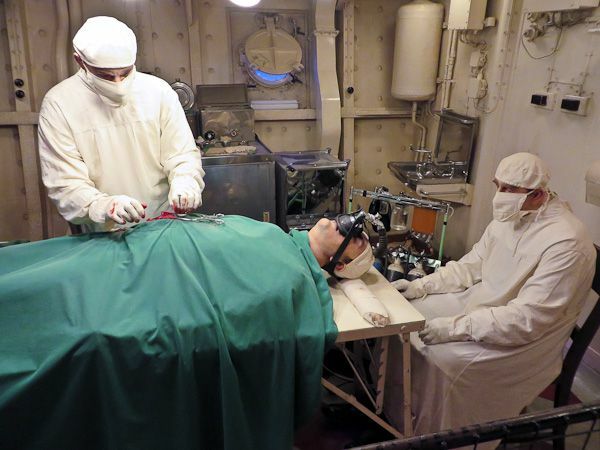 Some of the rooms had mannequins in them to give a feeling that there are sailors still on board ship - this worked very well and really added to the atmosphere. Watch out for the mail room where there is a grumpy looking postmaster! Then one of my favourite areas - the galley. We walked through this room and saw "today's menu" being prepared - lots of huge ovens, deep fat fryers, vats of food (complete with plastic food! 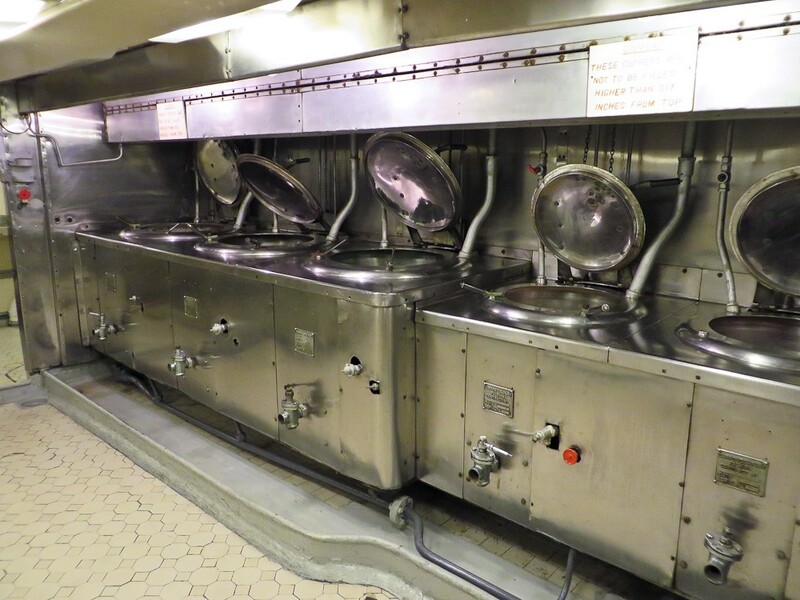 ), meat slicers and electric mixers, veg preparation room, serving hatch - even piles of dirty pans waiting to be washed - everything needed to feed hundreds of sailors every day. Next we climbed down some steep ladders to one of the main working parts of the ship - the boiler and engine rooms on the lower decks. As there were lots of ladders and small access-ways in this area, children under 4 feet tall were not allowed down (also you were not allowed to carry small children or babies). This was a fascinating area, with pipes, wires and machinery everywhere! 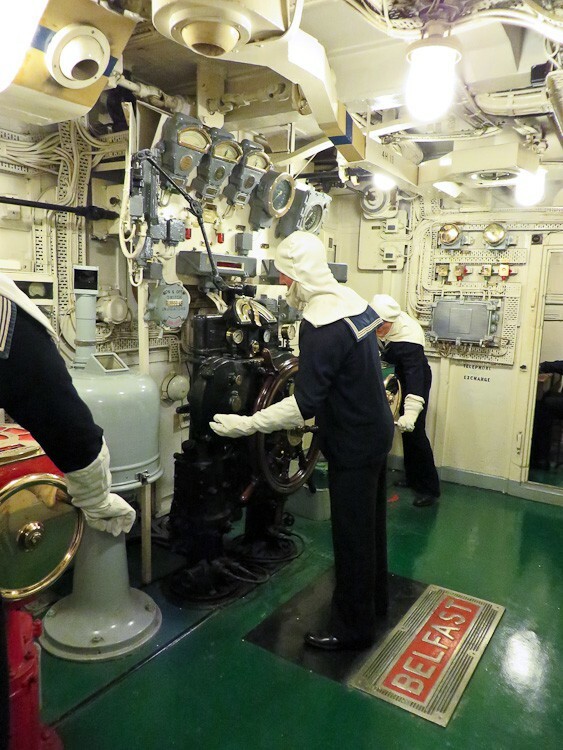 Interestingly, the sailors' washrooms were located next to the boiler - so ensuring a copious supply of hot water to wash in! In the engine room there were small platforms allowing you to get close to the many different pieces of machinery. 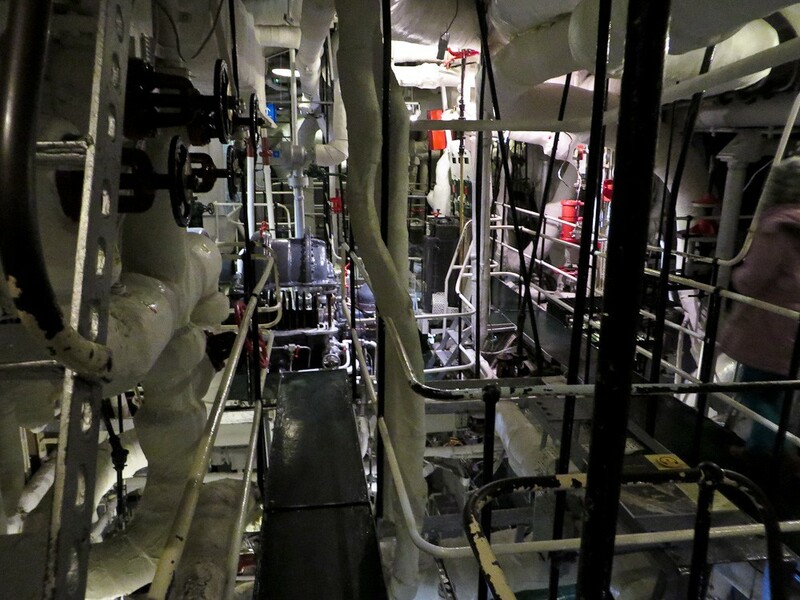 After exploring this cramped area, we returned to the Main Deck to continue our tour down the main corridor. Next came the medical section of the boat - a dentist's room (with realistic sound effects), and the sick bay. There was a re-enactment of an operation in progress in the sick bay! 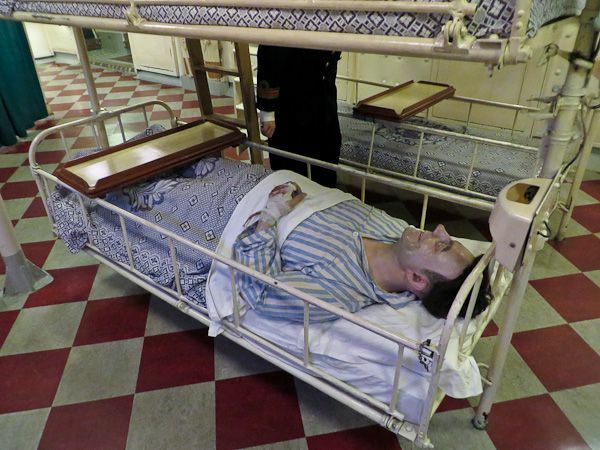 There were even patients sleeping in the four sick bay beds. 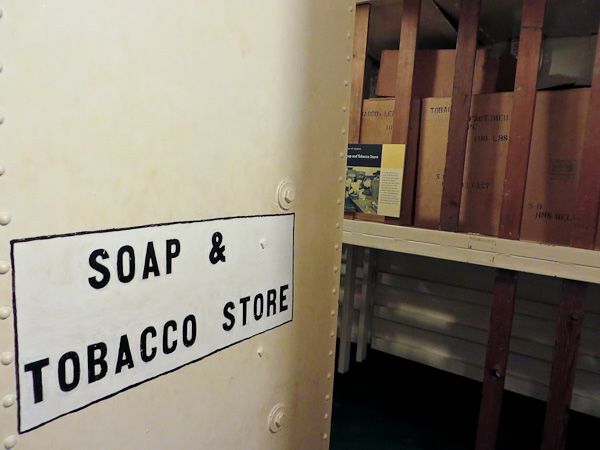 At one point we came across a strange store room - exclusively for tobacco and soap! Apparently these items are very pungent and can taint anything that they are stored with, so they were stored together away from everything else! 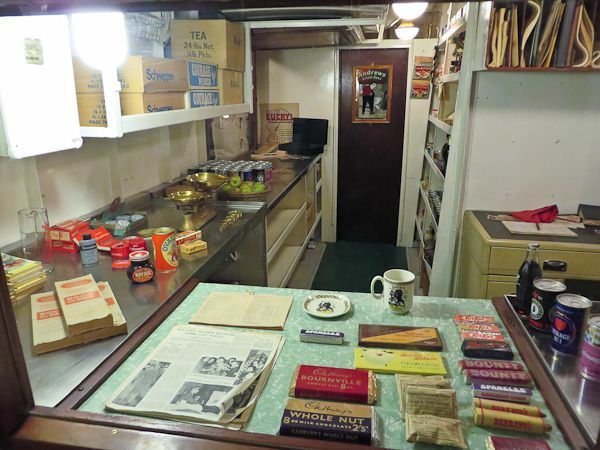 Towards the front of the ship, we found the Arctic Messdeck - one of the crowded living areas, complete with models of sailors in their hammocks, and others chatting or writing letters home. 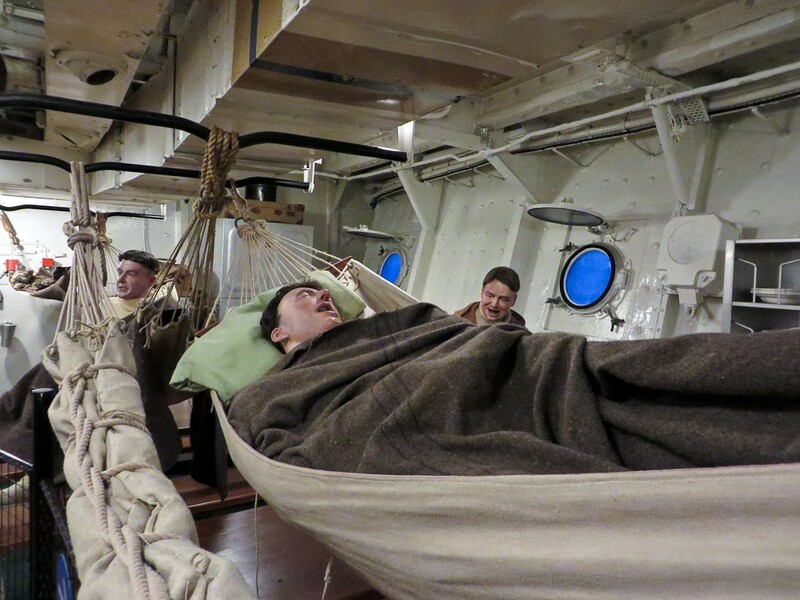 It was amazing how close together the men had to live - their hammocks were only 52 cms apart! 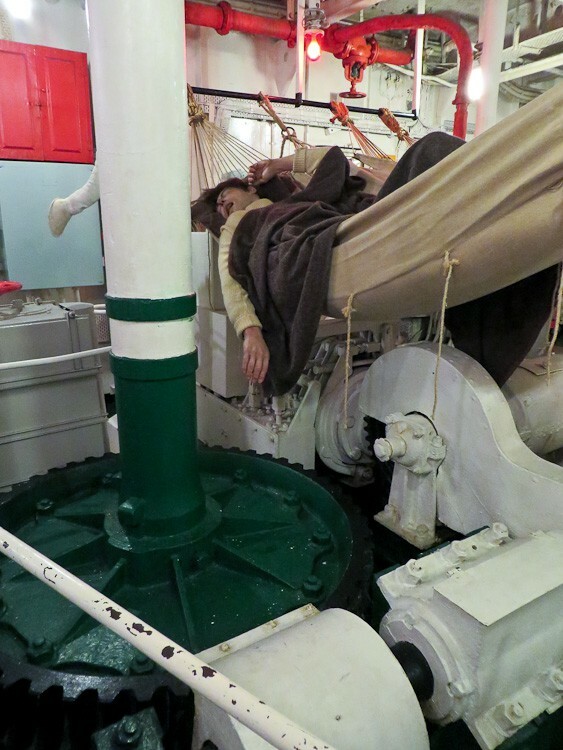 Some of the hammocks were slung over the working machinery of the ship - we got a good idea of the crowded conditions. 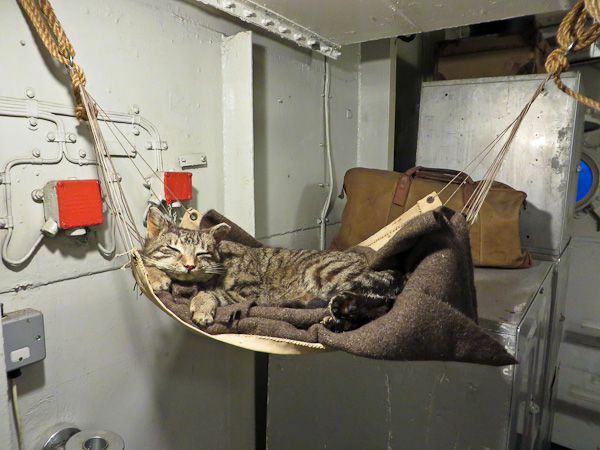 We even managed to spot a ship's cat, with his own hammock! At this end of the corridor there was a couple of interactive exhibits, one where you could practise your knots, and another where you could send a light signal to a ship in the distance, and get an answer back! 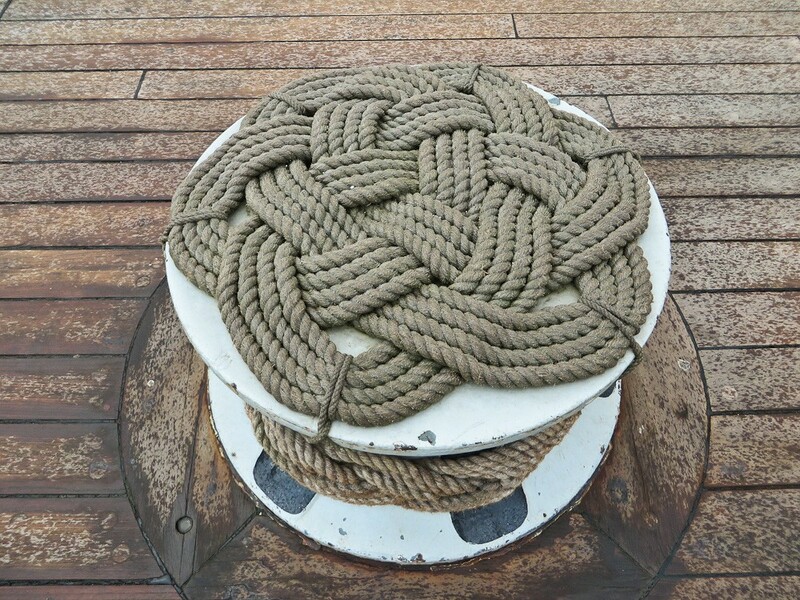 Once we had reached the front of the ship it was time to explore the upper decks, which we were looking forward to. 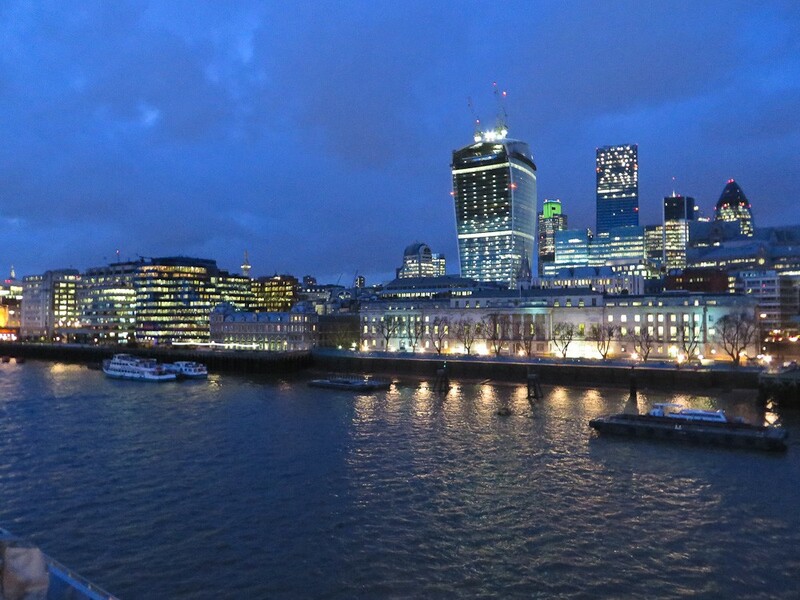 It was dark by the time we ventured out onto the outer deck, so we had some fantastic views of the lights up and down the Thames, with The Tower of London and Tower Bridge behind, and the city in front of us. The upper decks are where the control rooms were situated, including the operations room, the bridge wireless room and the compass platform, where the captain controlled the ship whilst at sea. It was fun to sit in the Captain's chair and look through the front window as if we were controlling the Belfast on a cruise down the Thames. We were running out of time when we got to the upper decks, as the ship closes at 5pm in the winter, so we could really have spent more time in this area, having a close-up view of the guns from the outside, and looking at the control rooms. The views really were fantastic, so it is well worth climbing up there! 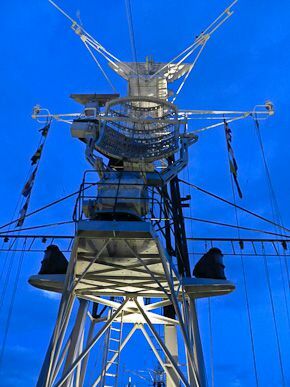 HMS Belfast was closing as we descended the ladders down to the main deck and the exit - we would have been happy to spend a lot more time exploring the ship! As we returned to shore along the walkway, we took one last look back at the magnificent ship lit up against the lights of London and the night sky. 1. We would recommend allowing much more than the recommended 90 minutes to see HMS Belfast especially if you want to see everything in detail (i.e. read all the notices and study the exhibition). We had two hours to see the ship, and the staff were having to chase us out at the end! 2. It is quite strenuous to climb over the whole ship - if you are not able to climb ladders and duck through doors, you will not be able to see everything. 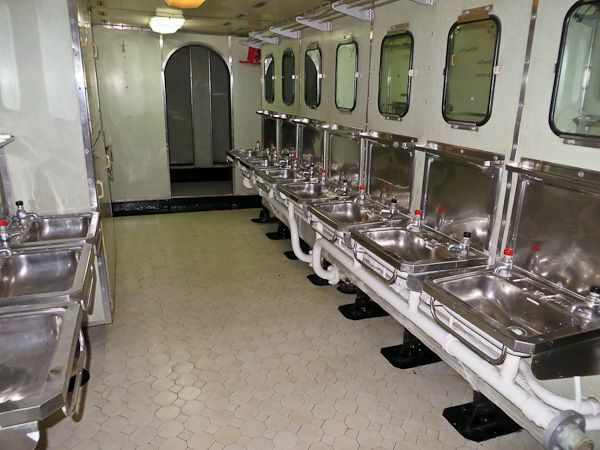 However, the main deck is accessible to wheelchairs and assistance dogs (but you won't be able to see the engine rooms or the upper decks). 3. If you visit in the winter, remember that it will be dark by 4pm or so, so if you want to see the views of the Thames in the daylight, it might be worth visiting the top decks of the ship in the earlier part of the day. (The guide book tour recommends doing them last). Alternatively, the views of the Thames and Tower Bridge as all the lights come on is well worth seeing too! 4. HMS Belfast does not have enough room to provide a luggage storage area, so you will struggle if you have big bags or suitcases - some of the corridors and doorways are very narrow. Best to just take a small bag so you can nimbly nip up and down the ladders! 5. The upper decks close 10 minutes before the ship closes to the public, so it's worth heading up there in good time - there is an announcement 20 minutes before closing time. There are two cafes available in the visitor entrance building - the downstairs cafe-bar which is open all year, and the upstairs rooftop bar, called the Upper Deck. The Upper Deck is closed in the winter, and opens in March. On board the ship there is the Walrus Cafe, which is open during weekends and school holidays. There are accessible toilets available, and there is a lift to enable wheelchair users access to the main deck and the Walrus Cafe. HMS Belfast was originally commissioned into the Royal Navy as a light cruiser (a warship which was used to protect Britain's sea trade route) on the 5th August 1939. From that time until the ship was opened to the public in 1971, the vessel had many and varied roles from protecting Arctic Convoys in the Second World War, to evacuating survivors of Japanese prisoner of war camps and serving in the Korean War. HMS Belfast was ordered in 1936 by the Admiralty along with her sister ship HMS Edinburgh. They were "Southampton" class large light cruisers, with 6-inch guns and a displacement of 10,000 tons. The ship was constructed by renowned shipbuilders Harland and Wolff of Belfast. She was launched by Anne Chamberlain, the Prime Minister's wife, on St Patrick's Day, 17th March 1938. In August 1939, after fitting out and builder's trials, HMS Belfast was finally commissioned into the Royal Navy. The cost was £2,141,514 for the build, including £75,000 for the guns and £66,500 for aircraft. HMS Belfast was immediately pressed into service, as war was declared with Germany in September 1939. She went to Scapa Flow in Orkney as part of the 18th Cruiser Squadron. She patrolled the Northern Waters helping with the maritime blockade on Germany. This involved stopping and searching merchant ships which might be carrying supplies into Germany. One of HMS Belfast's greatest successes during this period was the capture of the German liner SS Cap Norte which was disguised as the Swedish ship Ancona (a neutral vessel). 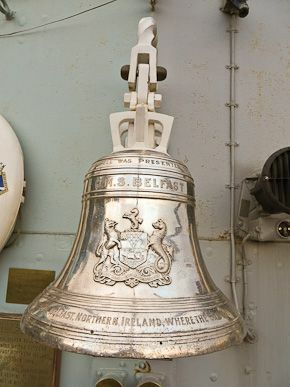 However, HMS Belfast's initial period of active service came to a sudden end on 21st November 1939, when she was hit by the detonation of a magnetic mine. (You can find out how magnetic mines work in a special display on board the ship). The magnetic mine caused a lot of damage (though thankfully injuries were light). It took 3 years to repair her ready for action - almost as long as it took to build her! Once repaired, Belfast had been turned into the largest and most powerful cruiser in the Royal Navy - her displacement was increased to 11,500 tons, and she was given the most up-to-date radar and fire control systems. She joined the 10th Squadron for most of 1943, in the icy waters of the arctic, and was tasked with providing protection for Arctic convoys to the Soviet Union. 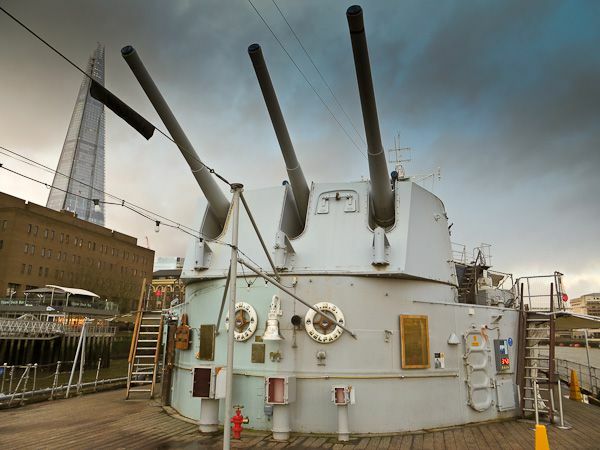 HMS Belfast is famous for her part in the sinking of the German battle cruiser Scharnhorst on 26th December 1943. Thanks to British intelligence, the navy knew that the Scharnhorst was planning to attack our arctic convoys. The command were able to put British war ships and cruisers (including HMS Belfast) in place so that the German ship was cut off, and eventually HMS Belfast and HMS Jamaica were given the order to sink her with torpedoes. The raid on the German battleship Turpitz in northern Norway in March 1944 is also one of HMS Belfast's successful missions. 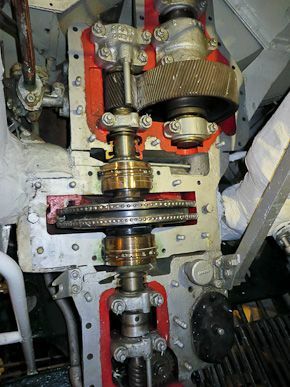 She was part of the powerful force which destroyed Germany's last surviving heavy battleship. HMS Belfast played her part in the D-Day landings in Normandy on 6th June 1944. For five weeks she supported the ships involved in this assault, and she is said to have fired one of the first shots on D-Day! During the Korean War, HMS Belfast spent over 400 days on active patrol supporting the retreating American and South Korean troops. After this, she had a major refit in Devonport Dockyard to prepare her for peace-keeping duties including missions to some of the world's most exotic ports. 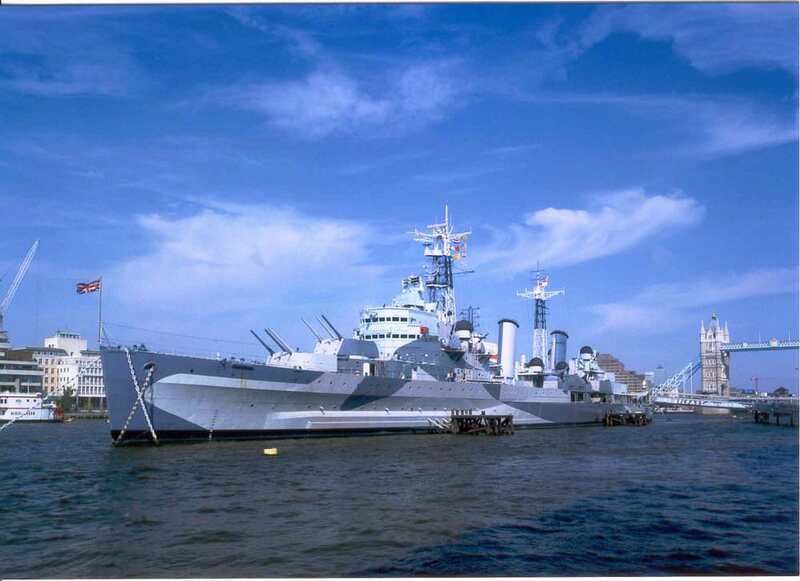 Finally in 1963, it became clear that Britain no longer needed HMS Belfast, even for peace keeping duties, so after her last exercise in the Mediterranean, she was retired and reclassified as a harbour accommodation ship. 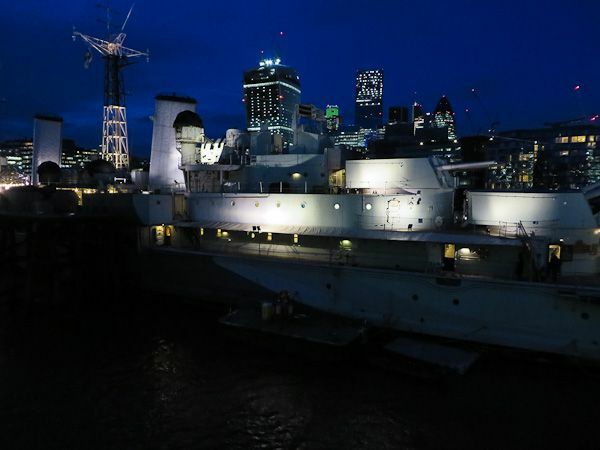 HMS Belfast was saved from the scrap-yard by an independent trust headed up by one of her former captains called Rear-Admiral Sir Morgan Morgan-Giles. 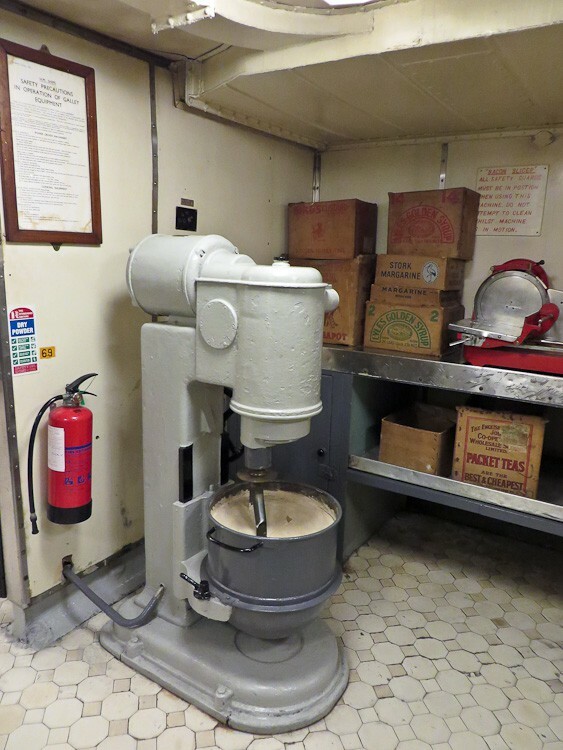 This trust campaigned for many years to save HMS Belfast, until finally, in 1971 she was brought to London and opened to the public on 21st October, Trafalgar Day. In 1978 HMS Belfast became a branch of the Imperial War Museum. 10.00am to 5.00pm (last admission 4.00pm). 10.00am to 6.00pm (last admission 5.00pm). Closed: 24th, 25th, 26th December. Please allow at least 2 hours for your visit. Last Admission is 1 hour before closing. 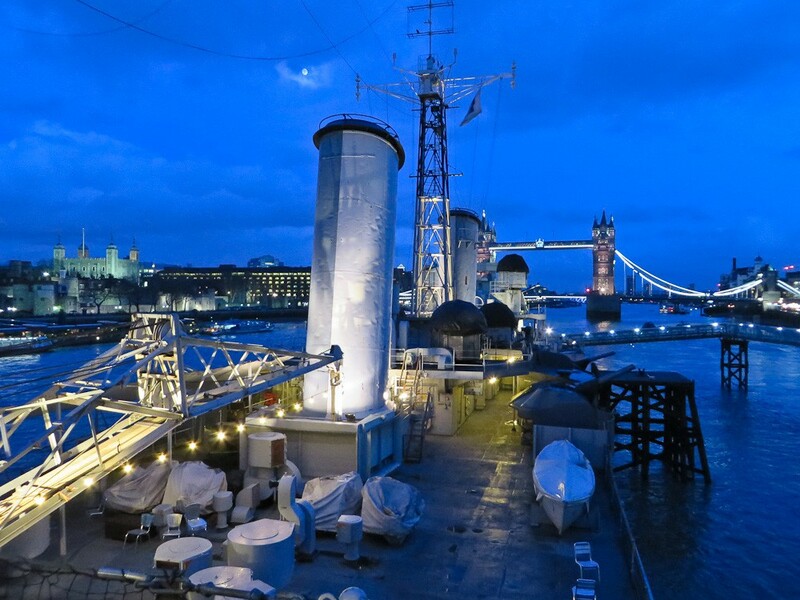 During adverse weather, it may become necessary for certain ladders and upper decks on HMS Belfast to be closed at short notice. Please ask a member of staff on board for more information. 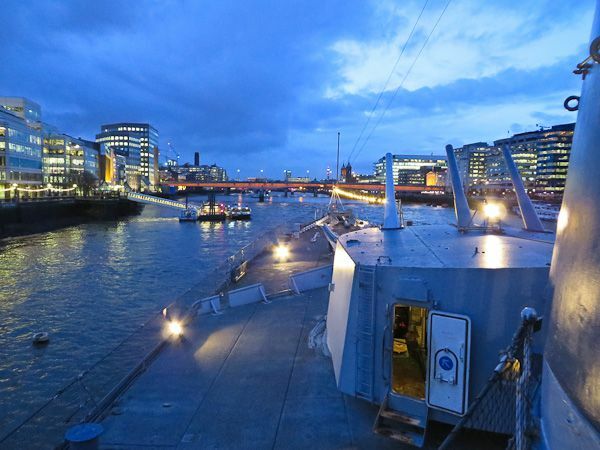 Occasionally we may need to close early - any planned closures will be noted on the HMS Belfast website. *Your ticket price includes a voluntary donation. By making a donation, you will be making a valuable contribution to the care and conservation of this historic site. And, if you are a UK tax payer, your donation will enable us to claim Gift Aid on your entire admission payment. Mainline Railway: London Bridge Station. Underground: London Bridge; Monument or Tower Hill. Bus: Any bus to London Bridge.